Public Sector Pension Investment Board, Montreal, returned 1% in the fiscal year ended March 31, a news release said. 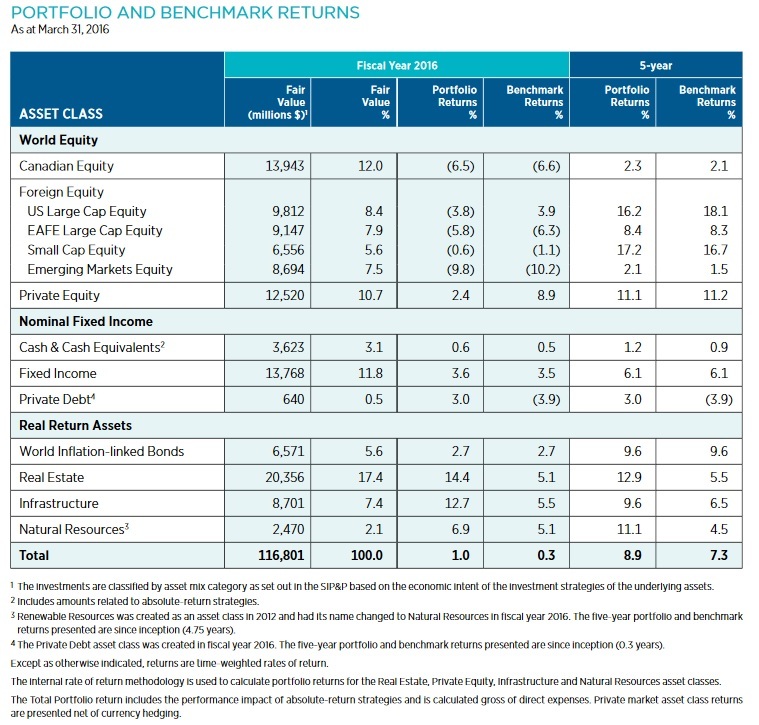 The C$116.8 billion ($89.5 billion) pension fund exceeded its policy benchmark return of 0.3%, and its best-performing asset class was real estate at 14.4%, followed by infrastructure at 12.7%. Natural resources returned 6.9%; private equity, 2.4%; and public markets, -3.2%. A final asset class, private debt, was first instituted in November and thus one-year returns are not yet available. As of March 31, the actual allocation was 58.8% public markets, 17.4% real estate, 10.7% private equity, 7.4% infrastructure, 3.1% cash and cash equivalents, 2.1% natural resources and 0.5% private debt. PSP Investments manages the pension assets of Canadian federal public service workers, Canadian Forces, Reserve Forces and the Royal Canadian Mounted Police. Officials at the pension fund could not be immediately reached to provide further information. I too reached out to PSP to arrange a conversation with André Bourbonnais, PSP’s President and CEO, but they told me he “wasn’t available”. Instead a very nice lady called Anne-Marie Durand, Senior Manager, External Communications, was polite enough to respond to my email and told me she’d be happy to answer my questions via email. Note to PSP and all other pensions: I work very hard covering your fiscal year results. The least you can do is have the decency to provide me with a short phone conversation with the CEO or CIO of your organization. I have no time to waste emailing questions to your communications people who aren’t investment officers. Moreover, some of the material may be sensitive in nature and not suitable or appropriate for email correspondence. Now that I got that out of the way, let me get to work because there is a lot to cover. Unfortunately, the journalists are asleep this week because apart from the one article I posted above, there isn’t any coverage on PSP’s fiscal year 2016 results by the major media outlets (by the way, you can now follow PSP Investments on Twitter here @InvestPSP). MONTRÉAL, July 21, 2016 /CNW Telbec/ – The Public Sector Pension Investment Board (PSP Investments) announced today that its net assets under management reached $116.8 billion at the end of fiscal year 2016 (fiscal 2016), compared to $112 billion at the end of the previous fiscal year. The total portfolio generated a return of 1%, exceeding the policy benchmark return of 0.3%, and created $0.9 billion of value added. Over the past five fiscal years, PSP Investments has recorded a compound annualized return of 8.9%, compared to 7.3% for the policy benchmark. It generated investment income of $37.3 billion, and $6.4 billion of value added above the benchmark. For the 10-year period ending March 31, 2016, PSP Investments recorded an annualized net return of 5.9%, and generated $7.2 billion of cumulative net investment gains over the return objective. “In a year characterized by high volatility and negative returns in most markets and by significant changes internally, our team has been able to provide a positive performance, both in absolute terms and against our policy benchmark return,” said André Bourbonnais, President and Chief Executive Officer of PSP Investments. “Most of our private market asset classes, and more particularly real estate, recorded strong returns during the year and surpassed their respective benchmarks. However, public equity markets posted negative returns and private equity underperformed. Our overall performance suffered as a result. After five consecutive years of positive, often double-digit returns, PSP Investments continues to exceed our long-term real return objective of 4.1%, thereby contributing to the long-term sustainability of the public sector pension plans whose assets we invest in order to provide financial protection for those who dedicate their lives to public service,” Mr. Bourbonnais added. Among the strategic initiatives undertaken in fiscal 2016, the position of Chief Investment Officer was enhanced with responsibility for implementing a total portfolio approach and evolving the portfolio construction framework by pursuing cross-functional investments with an efficient mix of asset classes. Private debt, which focuses on principal debt and credit investments in primary and secondary markets worldwide, was introduced as a new asset class in November 2015. It is a long-term asset class that offers attractive premiums on underlying illiquidity. Although it remains committed to Canada, PSP Investments is expanding its global footprint. It opened an office in New York where the private debt market is centred. It is developing London as a European hub to pursue private investment and private debt opportunities. PSP Investments’ net assets increased by $4.8 billion in fiscal 2016. Gains are attributable to net contributions of $4.0 billion and comprehensive income of $0.8 billion. Strong returns in Real Estate, Infrastructure and Natural Resources were partially offset by lower returns in Private Equity and negative returns in Public Markets. At March 31, 2016, Public Markets had net assets of $68.6 billion, compared to $76.3 billion at the end of fiscal 2015. In fiscal 2016, Public Markets recorded investment income of negative $2.5 billion, for an overall return of negative 3.2%, compared to a benchmark return of negative 2.3%. Most of Public Markets strategies performed above their respective benchmark, but the Value Opportunity Portfolio had a fairly significant negative impact on Public Markets’ performance. Over a five-year period, Public Markets has generated an annualized return of 7.9%, compared to a benchmark return of 7.5%. At March 31, 2016, Real Estate had net assets of $20.4 billion, an increase of $6.0 billion from the previous fiscal year. Direct ownership and co-investments accounted for 88% of Real Estate assets, an increase from 86% at the end of fiscal 2015. In fiscal 2016, Real Estate generated investment income of $2.3 billion, for a total return of 14.4%, compared to a benchmark of 5.1%. Over a five-year period, Real Estate investments produced an annualized return of 12.9%, compared to a benchmark return of 5.5%. In fiscal 2016, Real Estate deployed $3.5 billion in new investments broadly diversified across geographies and sectors, and had unfunded commitments of $1.5 billion for investments closed during the year. As at March 31, 2016, Private Equity had net assets of $12.5 billion, an increase of $2.4 billion from the previous fiscal year. Direct investments and co-investments accounted for 40% of the assets in the Private Equity portfolio, in line with fiscal 2015. In fiscal 2016, Private Equity generated investment income of $279 million, for a return of 2.4%, compared to a benchmark return of 8.9%. The portfolio generated distributions of more than $1.0 billion during the year, from realized capital gains, interest and dividends. 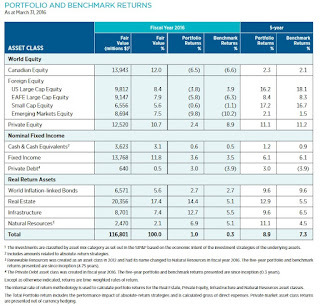 Portfolio income was primarily generated by investments in funds, including targeted funds of funds portfolio, and by gains in certain direct holdings. However, overall portfolio performance was offset by positions primarily in the communications and energy sectors, which were impacted by macro-economic factors, resulting in lower valuation multiples for many investments. Over a five-year period, Private Equity investments generated an annualized return of 11.1%, compared to a benchmark return of 11.2%. In fiscal 2016, Private Equity committed a total of $2.7 billion to funds with existing and new partners, and completed new direct investments and co-investments of $1.2 billion, including the acquisition of AmWINS Group, a leader in the wholesale insurance industry in the United States, and of Homeplus, one of South Korea’s largest multi-channel retailers, in a deal led by fund partner MBK Partners. As at March 31, 2016, Infrastructure had net assets of $8.7 billion, an increase of $1.6 billion from the previous fiscal year. Direct investments accounted for 86% of the assets in the Infrastructure portfolio, up slightly from 85% at the end of fiscal 2015. In fiscal 2016, the Infrastructure portfolio generated investment income of $940 million, for a return of 12.7%, compared to a benchmark return of 5.5%. The portfolio return was driven mainly by direct investments in the transportation and utilities sectors in Europe and emerging markets. Over a five-year period, Infrastructure investments generated an annualized return of 9.6%, compared to a benchmark return of 6.5%. In fiscal 2016, Infrastructure acquired a participation in Allegheny Hydro, LLC, and reinvested in Angel Trains Limited, Cubico Sustainable Investments Limited and AviAlliance GmbH. It also committed to an agreement to acquire a New England portfolio of hydroelectric assets from ENGIE Group for an enterprise value of US$1.2 billion. As at March 31, 2016, Natural Resources had net assets of $2.5 billion, an increase of $1.0 billion from the previous fiscal year. Direct investments accounted for 96% of Natural Resources assets. In fiscal 2016, Natural Resources generated investment income of $150 million, for an overall return of 6.9%, compared to a benchmark return of 5.1%. Portfolio returns were primarily driven by investments in timber and agriculture, which generated a return of 20.5%. Valuation gains were materially offset by markdowns in oil and gas investments. Since its inception in June 2011, Natural Resources has generated an annualized return of 11.1%, compared to a benchmark return of 4.5%. In agriculture, Natural Resources continued to expand and add to the number of investment platforms in which it participates alongside high quality, like-minded operators in some of the world’s lowest cost regions, including Australasia, North America and South America. Private Debt was approved by the Board of Directors as an asset class in November 2015. It focuses on principal debt and credit investments, in primary and secondary markets worldwide. Private Debt’s priority is to provide credit capital to non-investment grade US and European corporate borrowers. It has a target allocation of 5% of PSP Investments’ assets under management. At March 31, 2016, Private Debt had funded net assets of $640 million across six direct investment transactions. In fiscal 2016, Private Debt generated net investment income of $1.4 million, resulting in a rate of return of 3.0%, compared to a benchmark return of negative 3.9%. Portfolio returns were driven by upfront fees, coupon interest, valuation adjustments and foreign exchange gains and losses. The return of the asset class was negatively impacted by the fluctuation in the Canadian dollar, resulting in significant foreign exchange losses for the year. The rate of return in local currency (US dollars) amounted to 9.1% for the year. In fiscal 2016, Private Debt committed to a total of US$2.3 billion, including a significant financing commitment alongside partner Apollo Global Management, LLC, to participate in the take private transaction of The ADT Corporation, a leading home and business security monitoring company. For more information about PSP Investments’ fiscal year 2016 performance or to view PSP Investments’ 2016 Annual Report, visit investpsp.com. The Public Sector Pension Investment Board (PSP Investments) is one of Canada’s largest pension investment managers with $116.8 billion of net assets under management as at March 31, 2016. It manages a diversified global portfolio composed of investments in public financial markets, private equity, real estate, infrastructure, natural resources and private debt. Established in 1999, PSP Investments manages net contributions to the pension funds of the federal Public Service, the Canadian Armed Forces, the Royal Canadian Mounted Police and the Reserve Force. Headquartered in Ottawa, PSP Investments has its principal business office in Montréal and offices in New York and London. For more information, visit investpsp.com or follow Twitter @InvestPSP. Since when did PSP’s website become investpsp.com and not investpsp.ca? Both websites work but I guess given the “global focus” dot.com is more appropriate. Anyways, let’s get on with analyzing PSP’s fiscal 2016 results but before we do, please take the time to read the Chair’s Report (page 12), the President’s Report (page 14) and the interview with PSP’s CIO, Daniel Garant, on “One PSP” on page 23 of PSP’s 2016 Annual Report. The complete 2016 Annual Report is available here and in my opinion, it’s excellent and well worth reading all of it which I did yesterday. But if you can’t read it all, at least read the passages I mentioned because it’s important to note, this isn’t Gordon Fyfe’s PSP, it’s clearly André Bourbonnais’s PSP, and there are important strategic and cultural shifts going on at this organization. Of course, as you will read below, there are some benchmark legacies from the Gordon Fyfe/ André Collin/ Derek Murphy/ Bruno Guilmette days that still linger at PSP (the players change but gaming benchmarks goes on unabated, especially in Real Estate). As you can see, the benchmarks for Public Markets are pretty straightforward and widely recognized in the industry. However, when it comes to Private Markets, things become a lot less clear. 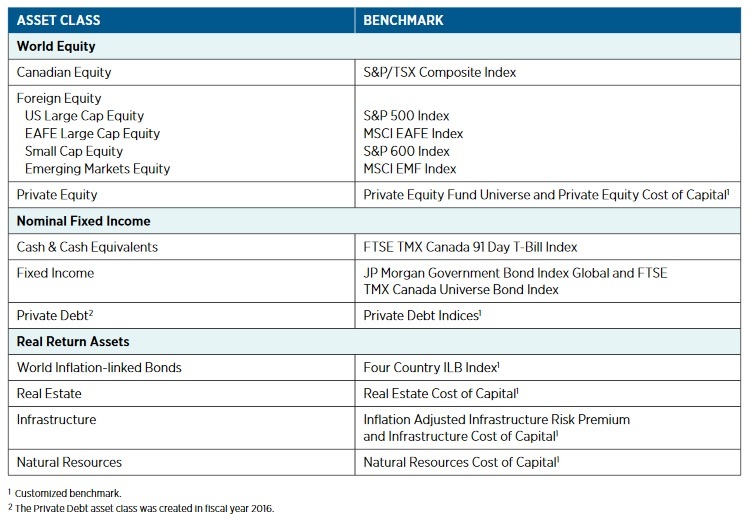 Private Equity has a benchmark which reflects the Private Equity Universe (plus the cost of capital), which is fine, but Real Estate, Infrastructure, and Natural Resources all have “custom benchmarks” which reflect their cost of capital, and this is far from fine. Why are benchmarks critical? Because benchmarks are how you calculate the value-added of an investment portfolio which determines compensation of senior investment officers. And if the benchmarks don’t reflect the risks, opportunity cost and illiquidity of the underlying portfolio, pension fund managers can easily game their benchmark to their advantage. As you can see, PSP Investments reports portfolio returns vs benchmark returns for fiscal year 2016 and the annualized portfolio returns vs benchmark returns for the last five fiscal years. This is great, every pension fund should report this along with a clear and in-depth discussion on the benchmarks they use to gauge value added in public and private markets. Now, notice the huge outperformance of the Real Estate portfolio in fiscal 2016 (14.4% vs 5.1% benchmark return) and over the last five fiscal years (12.9% vs 5.5% benchmark return)? The same goes for the Infrastructure portfolio. In fiscal 2016, it returned 12.7% vs 5.5% for its benchmark and over the last five fiscal years, it returned an annualized rate of 9.6% vs 6.5% for the benchmark (over a longer period, the benchmark for Infrastructure seems appropriate). So what’s the problem? The problem is these two asset classes make up a quarter of PSP’s asset mix and when I see such outperformance over their respective benchmark over one or five fiscal years (especially in Real Estate), it immediately signals to me that the benchmark doesn’t reflect the risks of the underlying portfolio. Not only this, PSP’s Real Estate has accounted for the bulk of the value-added since its inception (both in dollar and percentage terms), and this has helped senior officers at PSP collect multi millions in compensation. 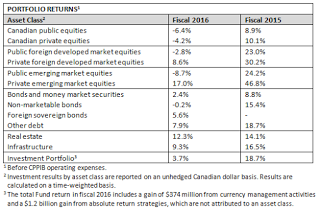 Now, for comparison purposes, I looked again at my comment on CPPIB’s fiscal 2016 results. PSP and CPPIB are similar pension funds in many ways except the latter is much bigger. But they both have fiscal years that end on March 31st and their asset mix and liquidity profile are similar. So why did CPPIB gain 3.4% in fiscal 2016 and PSP only 1%? A big factor behind this relative outperformance is that CPPIB doesn’t hedge currency risk whereas PSP is 50% hedged, so the former enjoyed currency gains across the public and private market investments (PSP is reviewing its currency hedging policy and will likely move to no hedging like CPPIB). But it’s not just currency gains, CPPIB had a stellar year and really fired on all cylinders across all its investment portfolios. The overall results don’t reflect this but if you dig deeper and analyze the results properly, you will see this. 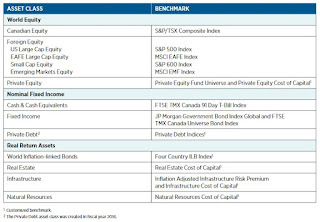 Notice, however, that CPPIB doesn’t report the same way as PSP, namely, portfolio returns over one and five fiscal years relative to benchmark returns. This is because CPPIB has one of the toughest Reference (benchmark) Portfolios in the industry (CPPIB provides an in-depth discussion on risk and how they benchmark investment activities and they do consider opportunity cost and illiquidity). It has an elaborate and detailed way to measure risk of each investment but I wish it did report the same way as PSP because then I can show you the outperformance (or value-added) over benchmark at CPPIB is considerably less over one and five fiscal years for Real Estate (Yes, PSP returned more in RE but a bigger reason is the benchmark used in RE is alot easier to beat at PSP). I’ve discussed PSP’s private market benchmark issues before (see last year’s comment) and I want to make it clear, I have nothing against PSP’s Real Estate team. Neil Cunningham is a great guy and he and his team are delivering outstanding results but if I was sitting on the Board of PSP, they wouldn’t be getting away with this benchmark (Note: Even with a tougher benchmark, they would still outperform with these type of returns). 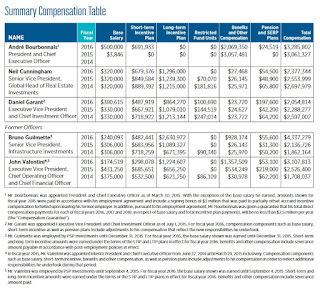 The compensation is fair and in line with short-term and mostly long-term performance. Sure, the senior investment officers at PSP get paid extremely well, especially by Montreal standards, but given the size of the fund and the investment activities across public and private markets that require specialized skill sets and given what other large Canadian pensions pay their senior investment officers, it’s not outrageous. What I find outrageous are the lavish severance packages. When I read how much former officers Bruno Guilmette and John Valentini earned, I almost fell off my chair. 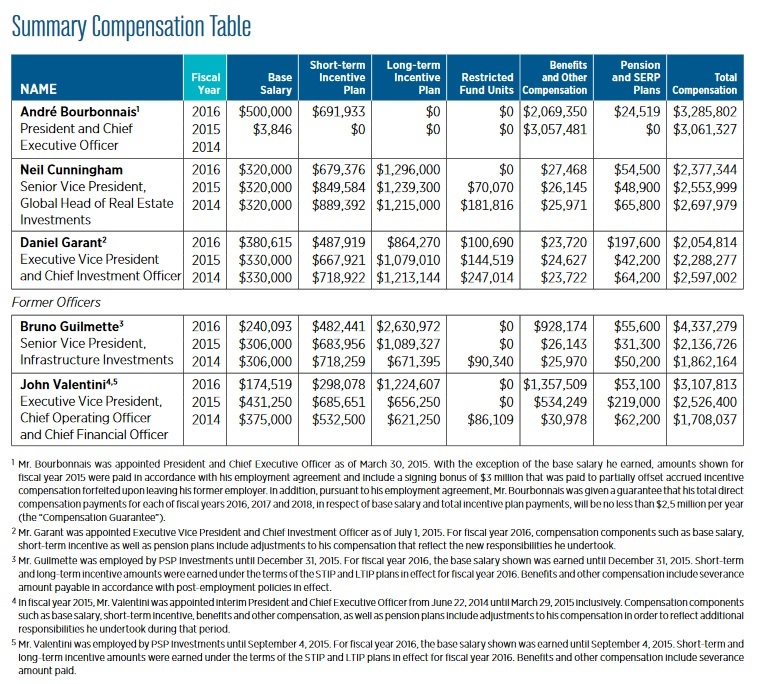 The amount includes a severance package which is clearly outlined in the previous annual report but still, these are huge packages. At least Bruno was a senior investment officer (“alpha generator”) but John was an interim CEO for nine months before André Bourbonnais was appointed CEO so that factored into his compensation (no worries, he landed on his feet quickly at Fiera Capital). Noticeably absent from these former officers is Derek Murphy, PSP’s former head of Private Equity. He left the organization soon after Bourbonnais took over the helm (either he quit or settled but his name doesn’t appear in the table above). He is now running a PE firm in Montreal called Aquaforte which helps institutional investors get a better alignment of interest with general partners (GPs). medium-term metrics to long-term absolute, total fund results. Another goal was to encourage more cooperation across the organization, again aligning individual success with the total fund, not just its component parts. This is a key element of One PSP. It was also decided that senior management should have a larger proportion of its compensation deferred and performance conditioned. The new incentive compensation plan will be driven by two key elements: 1) an annual overall assessment of PSP Investment’s performance based on a mix of relative (five-year) and absolute (seven-year) total fund investment performance, as well as five-year relative investment performance for individual asset classes, and the achievement of business units’ respective annual objectives derived from PSP Investments’ five-year business strategy, and 2) an annual assessment of personal objectives. First, as I stated, you should all take the time to read the entire 2016 Annual Report, especially the Chair and President’s report, as well as the interview with the CIO on “One PSP”. The Annual Report is excellent and provides a lot of details I cannot go over here. Second, there is no question that André Bourbonnais is trying to steer the ship toward a new and solid direction. He and his senior team have laid out a detailed strategic plan which includes cultivating One PSP, improving the brand locally and internationally, increasing the global footprint, creating scalable and efficient investment and operational activities, and developing their talent. Third, in my opinion, enhancing the role of the CIO with responsibility for implementing a total portfolio approach and evolving the portfolio construction framework by pursuing cross-functional investments with an efficient mix of asset classes is critical and very smart. Fourth, I was happy to see PSP is finally taking an initiative on diversity in the workplace, just like CPPIB is doing. I’m a big believer in diversity in the workplace at all levels of the organization and think that PSP, CPPIB and all of Canada’s Top Ten pensions have a lot of work to do on this front not just by promoting women and offering them equal pay but also by promoting visible minorities and incorporating other disadvantaged minorities like aboriginals and especially people with disabilities (Note to PSP: You should ask candidates to self-identify when they apply for jobs and have specific programs targeting minorities. All Canadian pension funds should follow the Royal Bank’s model and significantly improve on it). Fifth, the introduction of private debt as an asset class makes a lot of sense. You should all read a paper by professor Amin Rajan, The Rise of Private Debt as an Institutional Asset Class, to understand what private debt is all about and why PSP is perfectly placed to take advantage of this asset class. Sixth, I’m glad PSP is on Twitter and communicating a lot more about its investment activities (they should add a dedicated YouTube channel). You can find the latest articles on PSP here, including one that discusses the hire of Oliver Duff as managing director of principal debt and credit investments (Europe), to lead a European private debt push. That is all from me, I am literally pooped and want to go out to enjoy the summer weather. Before I do, I want to wish you a great weekend and publicly thank the few who support this blog via your donations and subscriptions. As for Mr. Bourbonnais and the rest of PSP, I wish you a lot of success and even though the new shift will have some bumps along the way, I’m confident the Fund and its beneficiaries and contributors will be better off in the long run.